In May of 2015, I download the Kindle app on my iPhone and decided to spend my insomnia hours reading rather than tossing around wishing I could go back to sleep. I had recently been on a YA kick, and had just finished making my way through books from John Green and Rainbow Rowell, and was looking for something new. 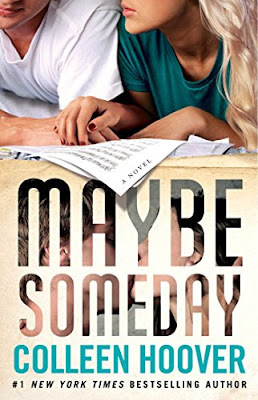 I don't even recall exactly how I ran across Colleen Hoover's Maybe Someday, but I am so glad I did! I now count Colleen Hoover as my most favorite author ever and will always one-click pre-order anything she writes! My review: Unlimited Stars- to infinity and beyond! When I tell friends about this book, I tell them that, other than reading the blurb above, they need to go in blind. It's super important to the story. I do say that this book absolutely moved me in the most beautiful way and it will always be one of my favorite books. I also LOVE the music tie-in to the book and immediately downloaded the music from Griffin Peterson and it's AMAZING and so cool to listen to the songs as you read the story. In fact, I wish the audiobook mixed the book and music together- has anyone talked to CoHo and Griffin about this???? :-) If you aren't familiar with Colleen Hoover's work, Maybe Someday is a great place to start!